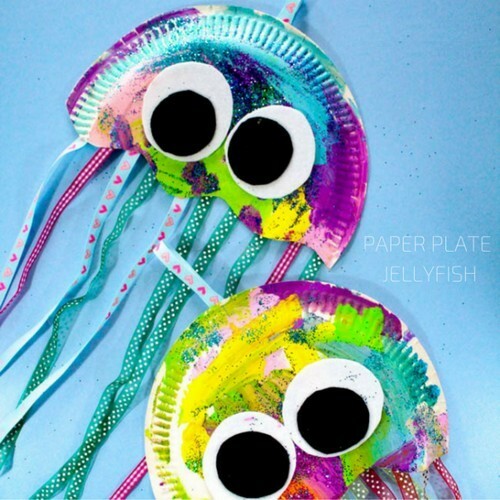 These paper plate jellyfish use supplies you’ll likely have in your home; and they’re more than just a rainy day boredom buster—they boost fine motor skills, and inspire fishy imaginative play! Hand your tot a paper plate, paint, and a brush (they could use their fingers, too!). Let them go wild. Next, sprinkle some glitter over the wet paint. TIP: Shiny sequins are a pretty substitute! Cut the plate into a ‘jellyfish’ shape. Turn plate over, then squeeze glue onto the freshly cut edge, and attach ribbon strands of differing lengths. Create eyes by cutting out white and black circles—or simply stick on googly eyes. Attach a hanging hook to a spare piece of ribbon, then secure ribbon to plate using a stapler. Alternatively, leave the hook, and let your littlies use their jellies in creative seascape roleplay!